Austin has seen dramatic growth and change within its central core. Urban developing stresses continue to press against the network of preserved parkland and water systems. Compounding this, city parks are experiencing over-popularity on decreased operating and maintenance budgets, creating crisis situations for parkland. Sand Beach Park addresses these issues and re-imagines a new benchmark for sustainable planning, design, operations and funding of urban parks. Sand Beach Park is envisioned as a tangible representation of values that the Austin community believes in: health and wellness, access, responsible development and environmental sustainability. 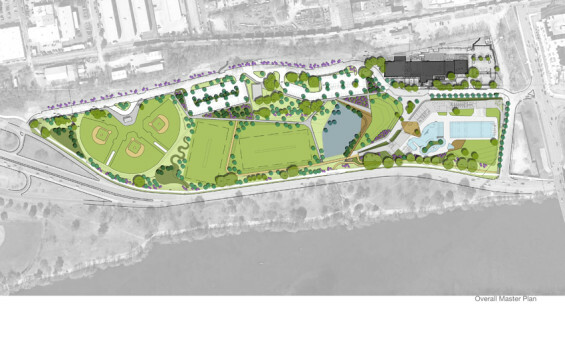 A community hub where world-class swimming facilities and multi-functional playing fields connect with off-site watershed stewardship and environmental planning. Water systems are a unique attribute to Sand Beach Park. Maximizing this opportunity to correct dated engineering, the design introduces a sedimentation/bio-filtration pond that treats the first flush for the eastern drainage channel. The system uses a sediment basin to allow runoff and large contaminants to settle out. This is coupled with a sand filtration area planted with water-loving, drought-tolerant plants to filter the runoff water and allow for the biologic uptake of contaminants and nutrients. 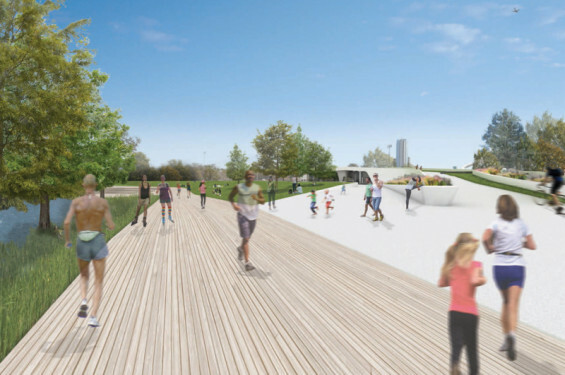 The biofiltration pond features a prominent boardwalk and promenade along the water’s edge, engaging visitors with the water-quality processes. A retention/irrigation system captures water and uses it for irrigation purposes throughout the park. Further balancing the water budget, pool and backwash water will be treated and re-used to irrigate the native vegetation on the green roof. Overall, this onsite pre-treatment infiltration is a pragmatic shift in stormwater management, as the landscape area now becomes the bioengineering system. 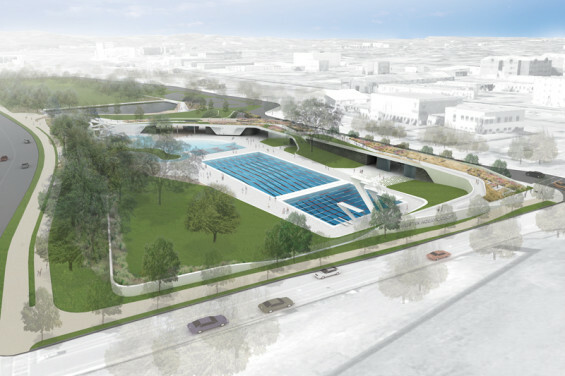 The Austin Aquatic Center at Sand Beach Park will provide the community with a place to gather, exercise, compete and enjoy. Constructed as an outdoor facility, layout follows existing circulation while limiting solar exposure to reduce building cooling expenses. The building design expresses a Euclidean geometry resting beneath an organic structure emerging from the landscape, creating an architecture “of” nature rather than “in” nature. 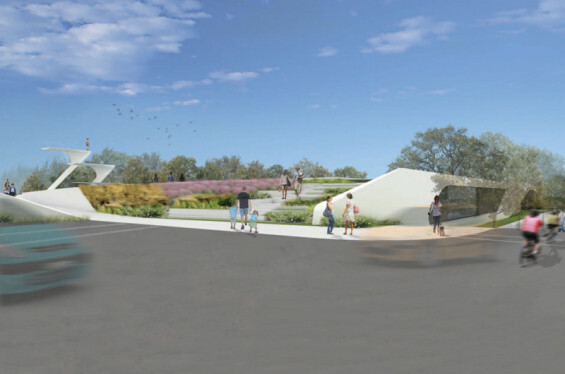 The accessible native-meadow roof system functions as both a living bridge and unifying datum, bending down to the site, providing visitors a unique way to experience the Aquatic Center and adjacent lake. Managed as a native meadow, the roof is part of the greater green infrastructure system, increasing biodiversity while directly aiding in urban heat island mitigation. Versatile in practice, the pool design provides opportunities for countless community programs including swimming lessons, water aerobics, underwater hockey, lifeguard training, kayaking and scuba diving classes. 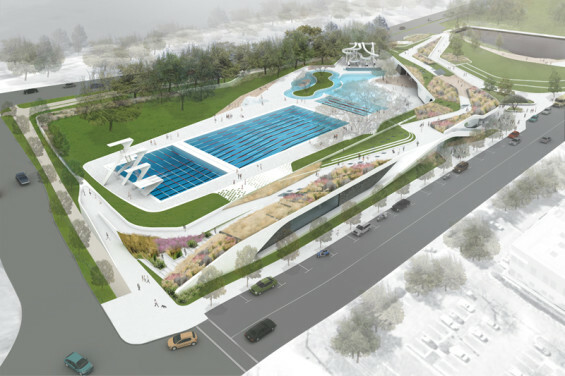 The Austin Aquatic Center will be the engine that funds the maintenance and operations of Sand Beach Park. The YMCA is a current neighbor with existing resources and drive to provide the necessary leadership to manage the Aquatics Center. All proceeds generated from the Aquatic Center will be utilized by a conservancy dedicated to the maintenance and upkeep of Sand Beach Park. This symbiotic relationship guarantees the necessary financial funding for a highly specialized park system such as this, that requires an advanced maintenance program. 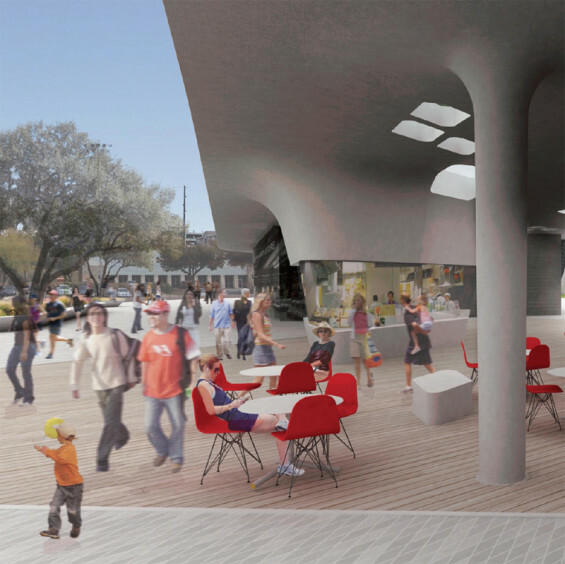 The open spaces all share multiple functions that celebrate the diversity of uses in Austin – farmers markets, music events, charity runs, an animal adoption center, ball fields and international swim meets that mesh with family swim lessons in a resort inspired water park. Cafes, restrooms and bike rental stores and community meeting spaces provide a day and night vibrancy to the park. A hierarchy of trails, over the roof of the swim center and around the new park reach into the core of downtown and outward to over 30 miles of the Lady Bird Lake Hike and the Bike Trail and Lance Armstrong Bikeway; and via the underpass below Cesar Chavez that directly links to the Western end of the Aquatic Center building. By celebrating the overall sense of place, landscape systems and sustainable infrastructure became an obvious driver for this project. Sand Beach Park re-imagines a new benchmark for sustainable planning, design, and operations and maintenance for urban parks. 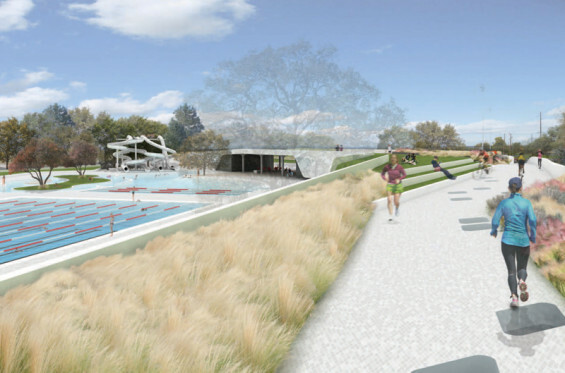 By providing a solution that challenged the original single-use rented ball-field mentality the design team created a new vision of how multi-faceted, shared use parkland can create a new magnet for triathletes, swimmers, runners, bikers, families and the larger community of Austin.